Our luxury Federal Hill apartments put you in the heart of one of Baltimore’s oldest neighborhoods, marked by history, delightful architecture and many things your heart desires. We are close to Baltimore’s bar scene and the beautiful Inner Harbor. One of the things you are in striking distance of is Cross Street Market Baltimore. If you want better food than you can find in the supermarket – swing by during the day and pick up produce, seafood and fresh meat. While there pick up a snack at, say, Steve’s Lunch or the Cross Street Cafe, famous for “Bruce Lee’s” chicken wings. They have a kick. The market can be something of a gathering place as people shop, eat, and relax. 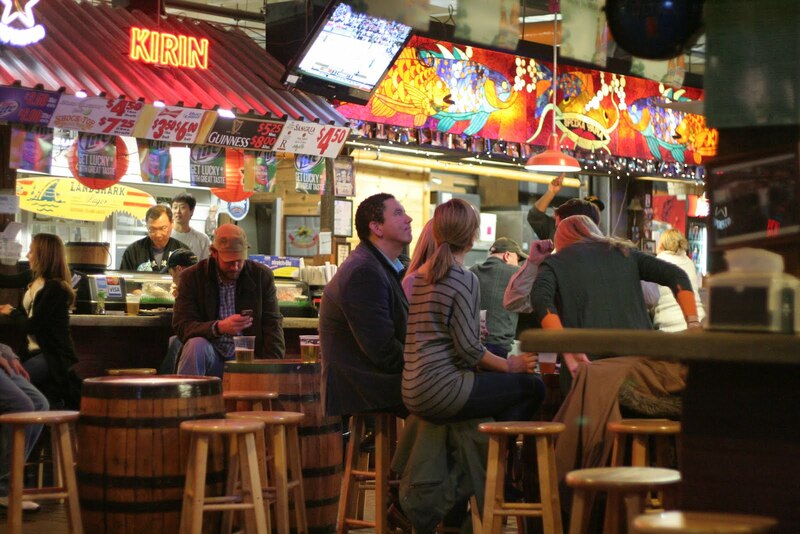 At night, Nick’s Seafood is the place to go with Happy Hour, sushi and seafood specials, freshly shucked oysters, and 25 beers on draft – including cheap 32 oz “big beers.” Game nights see it crowded with Orioles or Ravens fans. There is a proposal on the cards to revamp Cross Street Market, which would make it even better – adding a working greenhouse and crab deck on top of the current market. This would also increase the vendor capacity from 23 to over 30. The proposal also includes Saturday afternoon concerts and a more “family-oriented” feel. However, there is still not a final agreement, and no recent news on the development, which would also slice the market into three sections and open new pedestrian streets through it to improve the traffic plan and draw attention to vendors. If the development happens, it’s likely still at least a couple of years away. In the meantime, the aging, but attractive market remains the perfect place to get fresh fish and crabs right out of the bay, choice meats, cakes, pastries, fresh cut flowers and anything else you might want to take home with you. The market is open from 7am until 7pm – Nick’s Seafood stays open later on Friday and Saturday nights for those weekend crowds. Whatever kind of food you want, Cross Street Market almost certainly has it. The market runs along Cross Street between Light Street and South Charles Street, meaning it is about a block from our apartment building – the quickest way is to head up Patapsco Street. Yes, you can walk there! And back with whatever goodies you decided to pick up. It’s another great reason to choose this vibrant but historic neighborhood and our luxury building.